The Smith & Wesson Triple Lock is one of the finest firearms ever manufactured. Smith built some first rate revolvers prior to conceiving the Triple Lock, but none of them could compare to the quality of the world's first .44 Special revolver. S&W's No. 3 and Schofield revolvers were widely hailed in the United States and overseas, and had been used by the cavalry for a short time. The .45 Schofield cartridge just couldn't match the ballistics of the .45 Long Colt, therefore the military stuck with the Colt, leaving S&W to cater to the civilian market. Colt revolvers, the Single Action Army in particular, remained a dominant force in the handgun market until shortly after the turn of the 20th century. Smith's first swing-out cylinder double action revolver was introduced in 1896 and was known as the .32 Hand Ejector, and was chambered in .32 S&W Long. A short time later the .32 was overshadowed by the .38 Military and Police and the .38 S&W Special. These early Hand Ejector models were extremely popular, but Smith had a desire to build a large-frame revolver. The .44 Hand Ejector First Model—also known as the New Century or Triple Lock—made its first appearance late in 1907. The new .44 Special was a strong, beautifully designed revolver. The "Triple Lock" handle referred to its inventive, three-way lock up system. It was fitted with a lockup at the cylinder face, one at the end of the ejector rod, and the third was a rock-solid bolt and notch that locked the yoke into the frame at the rear of the heavy ejector-rod shroud that gave the revolver its unique look. The revolver's cylinder crane is a fine example of craftsmanship that proved to be super strong, allowing the revolver to withstand much more pressure than it was actually designed for. Considering the pressures of the .44 Special cartridge, it was clear that the addition of the yoke-lock wasn't really necessary and served mostly to showcase Smith & Wesson's capability of creating a precision, finely made revolver. The crane lock was the most expensive and difficult to manufacture feature of the revolver. The Triple Lock's frame was very much like that of its predecessor, but much heavier. Engineers at Smith & Wesson designed the Triple Lock to accommodate the brand new .44 Special cartridge, which they created by lengthening the .44 Russian case—increasing the case capacity from 23 to 26 grains. The added velocity resulting from the extra few grains of powder didn't amount to much at first, but with the later development of more efficient propellants, bullet speeds increased. Along with the .44 Specials, Smith produced the Triple Lock chambered in .44-40, .45 Colt, .455 Eley and .38-40. A number of guns were manufactured in .455 Mark II that went to the British during World War I. One of the few complaints about the Triple Lock came from British soldiers during the First World War who, in the trenches, found that the crane lock could easily fill with dirt, making the revolver temporarily inoperable. One of the oddities of the Triple Lock revolver was the fact that S&W didn't begin to heat-treat cylinders until about 1921. Colt had been heat-treating its cylinders since early in the century. Perhaps Smith disliked the idea of the extra cost, particularly when the Triple Lock was already expensive to build. S&W eventually redesigned the glorious New Century after turning out just over 15,000 of them. The new design became the Second Model Hand Ejector, which was much easier and less expensive to produce. Discontinued was the manufacture of the ejector rod shroud and crane lock, which made the revolver much less likely to foul with dirt. Several years back I ran into my old friend from Iowa, Lance Olson, the famed wildfowl conservationist and NRA board member. Lance has an impressive collection of Smith & Wesson revolvers, including some fine Triple Locks. Lance was kind enough to loan me a pair of his coveted Triple Locks since I'd had little or no experience in fooling with them. One was a 6.5-inch blued gun with factory target sights and the other a four-inch model in nickel, both chambered in .44 Special. The nickeled gun had belonged to the late Bill Jordan, and was the revolver he used as an aftosa rider on the Mexican border at the beginning of his law enforcement career. Both of the guns shot beautifully, and I immediately fell for the fine old design. Unfortunately, Olson didn't forget that I had the guns and drove to New Mexico from Iowa to relive me of them in short order. I knew one thing for certain: I had to have a New Century in my gun safe. Not long ago I had the good fortune of picking up a fine example of an early Triple Lock revolver. As many good old guns are, the Triple Locks are steadily going up in price, and I was lucky to find such a fine revolver with a reasonable price tag. The revolver is chambered for the .44 Special with a 6.5-inch barrel. The nickel finish is an outstanding 98 percent, though it was re-nickeled. Most collectors would be disappointed in the fact the gun had been refinished, but this revolver isn't typical. The serial number is in the low 200s, making it one of the very first Triple Locks to leave the factory. Smith & Wesson factory records indicate that the revolver was returned to them in 1916, and it is widely agreed among a few experts who've examined the gun that it likely left the S&W factory as a blued gun and sent back to be nickeled. The serial number is accompanied by the customary star stamp, indicating it had been worked on by the factory. The gun now has a few light blemishes but is in overall beautiful condition. The case colors on the trigger and hammer are bright and the markings are strong. The revolver's grips are the standard S&W checkered walnut and the sights are the fixed version with the high front sight blade. While many collectors might loathe the thought of firing such a fine old piece, I have no hesitation. I've spent a good deal of time at the range and out in the desert with my Triple Lock and don't regret shooting it whatsoever. It's an absolute pleasure to fire, and highly accurate. I first fired the old girl with Black Hills 210-grain FPL ammunition. Short-range accuracy was outstanding, and plinking out to 75 yards or so was a delight. The relatively light Black Hills 210-grain load is about as hot as I care to push the 103-year-old revolver, but since it's so sturdily built, I'm sure it would take a bit more—but why push it? The New Century is a big, heavy revolver, but the grip is actually slim and comfortable. 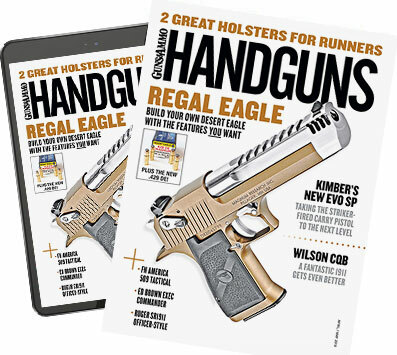 I've long preferred a narrow, thin grip on a handgun, and though the frame is large, the grip itself has a perfect feel in my hand. The weight of the Triple Lock and the relatively light Black Hills load makes for some pleasurable trigger time. While the 210-grain lead bullet might not be much of a game getter, it still makes for a formidable defense round, and in my old Triple Lock is very accurate. At 25 yards, the old gun prints a 2.5-inch group. The .44 Special was the platform used by Elmer Keith to begin experimenting with his 250-grain bullet at velocities of 1,000 fps and above. Keith claimed that the .44 Special was the "king of sixgun cartridges," and though he used the Colt Single Action revolver for much of his experimentation with the .44 Special, he also fancied the S&W Triple Lock. He later came to prefer the S&W Model 50 in .44 Special, and based on his years of experimentation, was able to talk Smith into introducing the .44 Special Magnum in 1956. Today the .44 Special seems to be alive and well, and rightly so. Many companies are currently manufacturing revolvers in the fine old caliber, and Smith & Wesson's Thunder Ranch Special, a four-inch N frame in .44 Special, seems to be selling well. It's best not to forget the original pulpit of the .44 Special cartridge â€“ the New Century revolver. We can only hope such magnificence in gun making will return sometime.